Ever After Music Festival will return to Kitchener, Ontario to celebrate its fifth year on June 7, 8, & 9th, 2019. Taking the celebrations to new heights, the festival has officially added a pre-party to kickstart what is sure to be their biggest edition to date. In addition to confirmed headlining performances from ILLENIUM, Kill The Snails,Excision and more, fans will be gifted with currently unannounced international bass talent set to headline the official pre-party on Thursday, June 6th.Pre-party tickets are complimentary with RSVP to all patrons who have already purchased their 2019 3-day Ever After Music Festival tickets – RSVP details will be sent via email on March 18th for current ticket holders. Camping package holders will receive complimentary pre-party admission automatically, no RSVP necessary. For those who have yet to purchase their 2019 Ever After Music festival tickets, pre-party admission will be complimentary for anyone that purchases a 3-day festival ticket by Wednesday, March 20that noon EST. Individual pre-party tickets will also available for purchase. 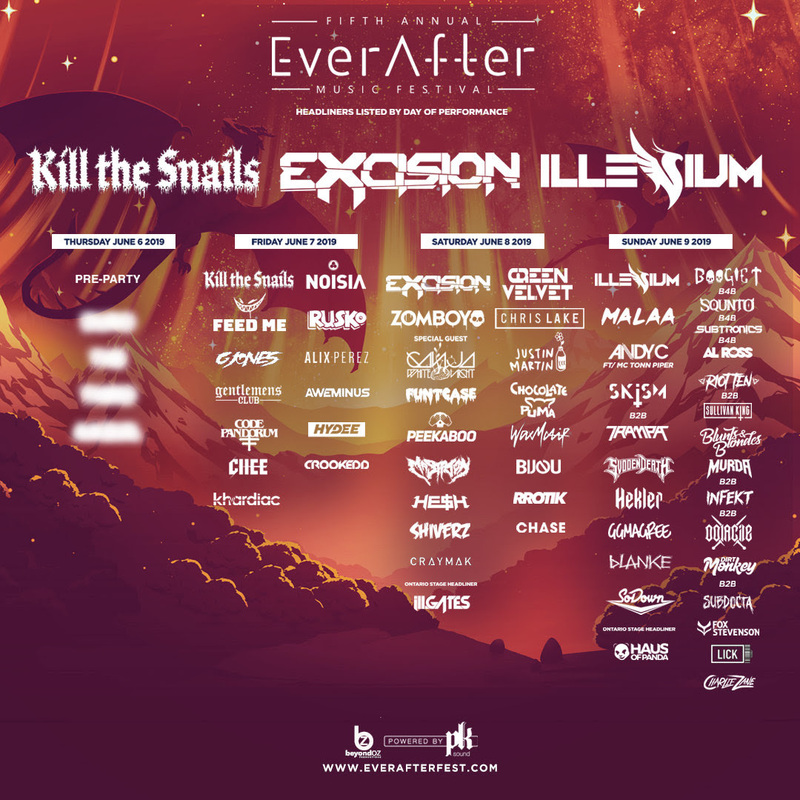 Kicking off with a festival pre-party complete with a roster of international talent – Ever After Music Festival will immerse fans in the most expansive edition to date. Enhancements for the festivals 5th edition will include upgraded sound quality, stage designs, additional water supply, exclusive VIP benefits, camping perks, and more. Fans are encouraged to purchase tickets as early as possible – tickets now on sale and available via www.everafterfest.com/tickets.